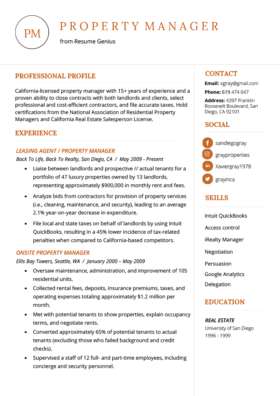 Applying for a property management position? Prove you’re the right person for the job with our free, customizable property manager cover letter sample. I am writing to submit my application for the property manager position that you are advertising on [Wesbite Name]. With 15 years of experience in property management, a BA in Real Estate, and the necessary federal and California state certifications, I believe that I would be an excellent fit for this role. My ability to liaise between property owners and tenants is second to none: I currently manage an exclusive portfolio of 47 luxury properties, representing around $900,000 in monthly rent and fees. In summary, I am an excellent communicator who can juggle numerous responsibilities, provide comfortable homes for tenants, and make sure that landlords receive their rent payments promptly. Thank you for having taken the time to review my application. I hope that I have given you some valuable insight into my background. I can be contacted at 619 474-047 or xgray@gmail.com. I look forward to hearing back from you.